A mother-daughter exhibition at Exeter Gallery promises to be something exceptional for anyone interested in perceptual painting: Eternal Sun, Paintings by Linda Carey and Kathleen Carey Hall. Matt Klos, the director of the gallery, sent out an announcement of the new exhibition last week and included a small sample of what’s on view. One of these paintings is to blame for a string of as-yet unchecked items on my To Do list—I spent much too long for my own good admiring this portrait, entitled simply Head. The mother-daughter pairing feels like an interesting offshoot of the shows Manifest regularly puts together combining work from teachers and students. From the images Matt sent, these two painters have clearly mastered perceptual painting and used its tropes and techniques to create an individual vision. Both have spent time studying and painting in Italy. Time abroad in that particular nation seems to be one of the best things a painter can choose to do these days—judging by the quality of the work it nurtures, glimpses of which are readily available in the feeds of many painters on Instagram. On the strength of the images Klos sent along, this is a show not to be missed. One of the two images, this particular portrait of a young woman—self-portrait maybe?—is a marvel of what the perceptual painters advocate. There’s a hint of pentimento, various self-evident ways of making paint itself as much of the point as the image it renders. There’s a deep tension between precision and looseness—or between predictable effects and seemingly risk-taking paint handling, daring the unexpected happy accident to emerge—and it gives a tremendous energy to what is an image of almost absolute stillness. The sitter’s expression is wonderfully ambiguous, serious and a bit lost in thought, but with a smile that seems to be just dawning, though if you try to pin down where this is happening, it’s tough to locate the particular signs of it in her face. It isn’t quite the Mona Lisa smile—somehow it’s even more ghostly and elusive. The background is a layering of so many tones—greenish blue, taupe, a spot of cerulean, pink and almost a stripe of pale rose at the far right, echoing all the colors in the face and lace-collared dress. That collar is wonderful, the way she has dragged the paint lightly over the darker blue of the dress underneath, so that the porous oil hints just enough at the filigree of the fabric to create a totally convincing impression of lace, and somehow—how?— it even looks a little starchy. The handling of tones is marvelous. 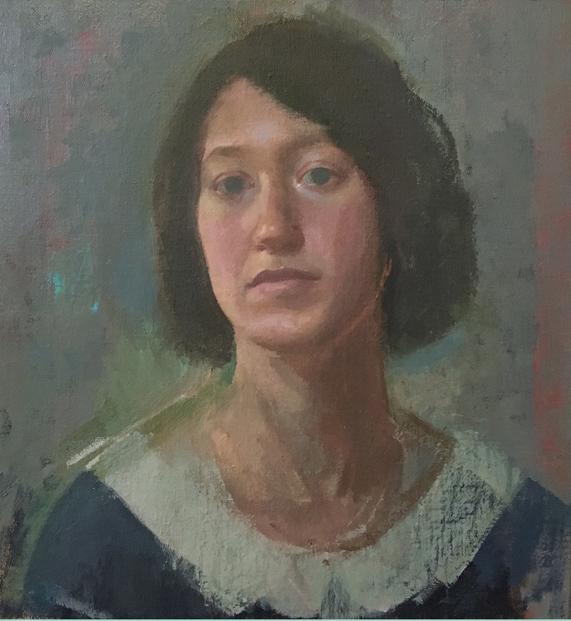 Over almost the entire surface, she works in the mid-range of values, keeping the tones muted and the saturation of the paint in the mid-range. But the color of the face itself is slightly more saturated in color and precise in form and line, and as a result it projects out toward the viewer, almost as if the sitter is peering through one of those cardboard images with a hole cut out for the head—but this works in a perfectly natural and evocative way here. As the skin tones come forward, vibrant and alive, the hair and the eyes are filmed in such a way, the tone is so much in the upper registers, that the pupils are entirely obscured and the color of her eyes is entirely indeterminate. Blue? Brown? Are we seeing a faded periwinkle glow reflected off the eye’s surface rather than the color of the iris itself? The effect of all this isn’t just technically impressive, but poetic. It creates that look of being absorbed, absent, remembering, but it also detaches the entire image from the present, so that one is justified in feeling as if this could even be the sitter’s grandmother as a young woman. In a similar way, the hair is almost entirely without detail and in a very light tone, so that in the entire painting there are only two spots of paint that might be considered relatively dark. This, as much as anything, is what I think Klos means in his lyrical appreciation of the two painters, when he writes that the sun of the Renaissance illuminates the work of these two. Piero’s work had this same kind of beatific luminosity. The only point in the painting where the paint’s value reaches an extreme is in the tiny highlight, not swimming on the surface of the sitter’s eyes, but in the inside corner of one eye—such an original touch, perfectly natural and completely realistic, but almost a modest, easily-overlooked stylistic tour de force, to apply that pinhead of pure light right there, at the corner of the eye rather than somewhere on the cornea, where one would always expect to find it. I’d love to think it was the last mark she made. Once you notice it, the entire painting seems to pivot around that little glint of pure white, serene and blank, where all the other colors in the painting are hidden.